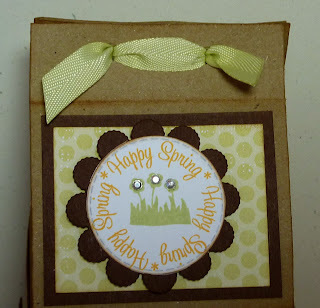 crafting with katie: My Creative Time February Stamp Release Blog Hop! Welcome to the My Creative Time February Stamp Release Blog Hop! Emma's release this month has completely gotten me in the mood for spring! If you haven't been to her blog yet today, head over now to see the video introducing the three awesome stamp sets AND some fun new dies! 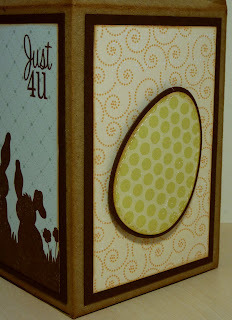 For my project today I am showcasing Hello Spring, a darling stamp set that includes layering egg dies! 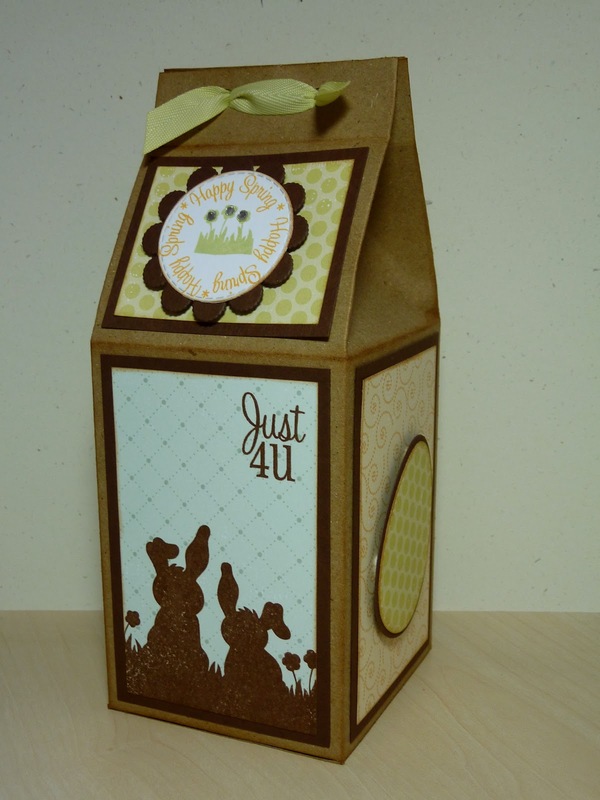 I thought it would be fun to make a milk carton that could be filled with chocolate eggs. I cut it out of kraft cardstock from The Paper Company with my Expression 2, using the Imagine All Wrapped Up cartridge at "Fit to Page." I then added a layer of dark chocolate cardstock and a layer of patterned paper from Papertrey Ink's Pretty Pastels on each of the panels. The front panel has one of my favorite images from Hello Spring. It's actually wide enough to use on the short side of an A2 size card, but I only needed part of it for my project. "Just 4U" is also from this set. I love that Hello Spring has a circle sentiment to use with Emma's Scalloped & Stitched Circle Dies! I added a little bling to the coordinating image. To seal my box, I punched holes in it and tied some PTI Spring Moss grosgrain ribbon. Here's another view of the box. Aren't the little chicks adorable? I colored them with some Copic markers. 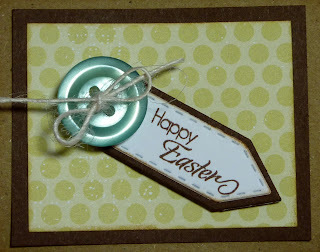 Of course, I had to add one of my favorite Teeny Tag Sentiments, stamped on paper cut with the Teeny Tag Dies. For our giveaway today, we are giving ONE lucky winner a $100 gift certificate to My Creative Time's new online store! All you have to do is leave a comment here along with on the rest of the design team's blogs, along with a way for me to contact you! Each designer will be picking a winner, and then Emma will use random.org to pick the lucky winner out of the 18 names! So remember, you have 18 chances to win! All you have to do is leave a comment on all of the blogs in this hop for more chances to win! The deadline is Sunday, Feb. 19th, at midnight PST. Easy peasy! Good luck!!! Your next stop on the hop is the wonderfully talented Kim! OMG!!!!!!!!!!!!! THIS IS SOOOOO STINKIN CUTE!!!!!!!! AWESOME JOB! LUV YA! Adorable! I love these little bunnies. This is so cute!! i love all the different panels on it!! So cute! I love 3d objects, and this is done perfectly! HI Great job love what you have done. Wow, what great projects. I love all the ideas. Great blog! Thanks for sharing. WOW...great box...your ideas are great....and your directions are great...and love how your product list also shows the product. This sure helps when not familiar with something..great job on it all!!! ooh love the milk carton! you need to fill it with some Whoppers! Love the milk carton box. Love the egg with the stitching. You did an amazing job on this! Love your project and everything that you added to it. What a cute gift that makes. How awesome is this!!!! Love all the fun stamps! So bookmarking this fab Easter gift idea! Lovely work! I love those shadow bunnies! Your blog is very nice too, I love how you have pictures and links to the products you've used. How clever and helpful!!!! I love your Easter bag!! Super cute!! I just ordered this stamp set today and can not wait until I get it!! Wow oh wow. This is GREAT. LOVE it. You have outdone yourself again. Loving how you made the sides all different. Great great great job. Great project! It will be fun to make the milk cartons instead of baskets this year!! TFS! That milk carton is so adorable! I love it!!! Katie~ I am LOVING how your mik carton turned out! The pastel colors are just GORGEOUS with the kraft paper! Oh you colored too! Great job! All of you panels turned out so AWESOME too! The embossing is just PERFECT again! Oh you used my favorite dies too ~ teeny tags! I love how you are going to fill the mini eggs in here ~ FOR ERIC! wink. wink! LOL Easter project done for your son! Always LOVE your creations! This milk carton project is awesome. Thanks for the inspiration. You always have great ideas. oh my goodness katie! this is just adorable! I love the blue & green with the chocolate brown! just perfect! Katie the milk cartoon is so cute! The stamps are adorable. TFS. This is soo stinkin' cute!! TFS!! and I love the stamp set!! so stinkin' adorable! perfect for easter. This is GREAT! Can you please tell me the finished dimensions? Thanks, Katie! Really love your milk carton - great idea instead of baskets this year for friends. Like that you decorated each side. Can't wait to get this set - thanks for the inspiration! So cute! As soon as I saw it I thought 'Chocolate'! 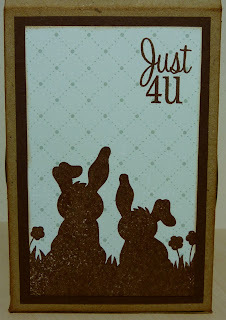 Must be all the lovely chocolate paper you used to create the sweet silhouettes and mats. Love the stamped images you used on it. Super cute project. love how you decorated it. Love all the projects, especially the Milk Carton. What a beautiful milk carton, i love the way you decorated it. Such a cute milk carton. I am so in love with the background stamps!! Such a cute idea - love how cute you made this with the papers, stamps and dies. LOVE IT! great projects. love the milk carton. WOW! I love it! I pinned it...would love to make some of these! Super cute milk carton!! Love the colors you used. Love the milk carton! Do you know if another cart has the milk carton cut? Wonderful project showcasing Emma's amazing stamp set. Love it, like how you decorated all the sides !!! Love, Love, Love! You did an amazing job! What a fabulous milk carton!! Love it!! OMG this is so cute. I love all the different panels on the milk carton. thanks for the inspifation. Your project is SO super cute! So super creative and cute! Thanks for sharing! OMG...your milk carton is just ADORABLE! Too cute, love it, thanks for sharing! I love this carton!! Wish I had an imagine so I could use that cartridge!! WOW! I love love love this!! So adorable! So adorable!!!! What a great way to present Easter treats!! Love it. The milk carton is so cool...love it. These are just too cute! I love your milk carton! Love it, can't wait to get my stamps in the mail. Thanks for sharing. I love your milk carton!! It is so cute dressed up with these new stamps!! What an awesome release! ABSOLUTELY ADORE this milk carton!!! Way too cute!!! I am seriously freaking out about this milk carton! It is just sooooo stinkin' cute...OMG!! You have totally inspired me to get out my All Wrapped Up cartridge and make one of these. A-MA-ZING! Love your milk carton great details. Katie: Very elegant the milk carton. I like the colors. Thanks for share! Love, love, love the milk carton and how you decorated it...TFS...these stamps really jump on the carton!! wow!!! Your milk carton is so super neat!! I love all these images! great job! I love this little milk carton! What a wonderful treat to find on Easter Morning! KATIE!! this is wonderful! great great idea! Just darling!!! LOVE those milk carton boxes!!! What a cute milk carton. I Likes. Absolutely love it! You are so creative! such cute projects. love your work. 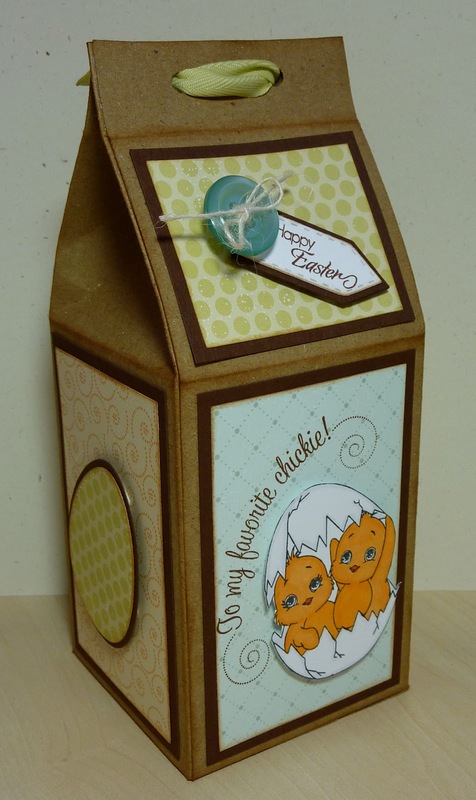 Very cute idea to make a milk carton for chocolate eggs! great box! love the colors and all the accents you used! I love this milk carton. I will have to check it out. Thanks for the inspiration. Cutest milk carton ever! I can't wait to try making one of these! Simply adorable! So cute, love the treat box. LOVE this project - It turned out FANTASTIC!!! Great milk carton. I so love this stamp set. Awesome container!!! I can think of so many things to fill it up!! I've really enjoyed all of your projects this week!!! Your milk container is absolutely beautiful, I love this cut and love how you added the extra details to it! I LOVE this milk carton! The bunny stamp is super cute! That milk carton box is the cutest! Love how you decorated it! What a lovely carton! I love how you decorated it so creatively. I love your projects. Where is the milk carton from? Emma's new release are absolutely beautiful! Such a cute milk box carton! Thanks for sharing! I LOVE this container!! I think that I NEED to get that cartridge. You have put the stamps are on wonderful display with this project. Fab job!! Love your milk carton and the way you used the stamps to decorate it - brilliant! What a great idea and I actually have that cartridge. The vintage look really adds to it. Thanks for sharing. I can't wait to try this milk carton! Love it! I think I just found the container for my grandkids Easter treats! Thank you! Adorable milk carton. Great job using Emma's stamps. Love it! Your milk carton is beautiful. Cute! I love that bunny shadow! You do such a great job decorating your projects! ;0) Really cute! I loved all your projects. My favorite . . . The milk carton. Nice! Such a darling project. I love each of the sides. I love the kraft base! Your work is ALL beautiful. I especially love the milk carton. All of your work is executed so perfectly!